Mark Halstead is eager to make the most of his opportunity when he makes his first league start for Blackpool against Millwall on Saturday. 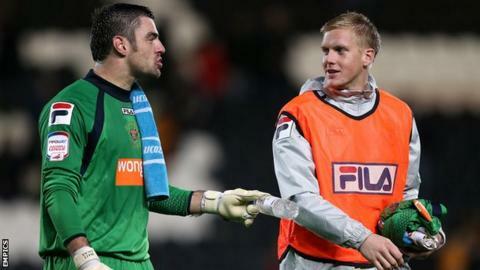 The 23-year-old has been the regular deputy to first-choice goalkeeper Matt Gilks at Bloomfield Road this season. But Gilks will serve a one-match ban after being sent off against Barnsley. "It will be nice. I just need to prepare right. Hopefully I can take my chance and I can show what I can do," Halstead told BBC Radio Lancashire. Halstead's only two starts for the club have come in the League Cup, and having patiently waited for a chance in the first-team he is keen to perform well. The former Stockport County, Kettering and Barrow loanee continued: "I prepare the same as he [Gilks] does, apart from on a matchday. We always do the same training during the week. "I always think I'm ready. I always prepare as if I am playing." Caretaker manager Steve Thompson said he would have qualms about starting Halstead, adding: "Mark came in and did fantastic [on Saturday]. He'll have his opportunity now."